Preheat oven to 375° F. Cover bottom and sides of 3-quart casserole dish with cooking spray. In large pan, cook macaroni as directed. Drain and set aside. In saucepan, melt 4 Tbsp butter, and blend in flour and seasonings. Bring to a boil (it will be dry). Add milk and cook until sauce is smooth and thickened, stirring constantly. Add the cheese, stirring until smooth. 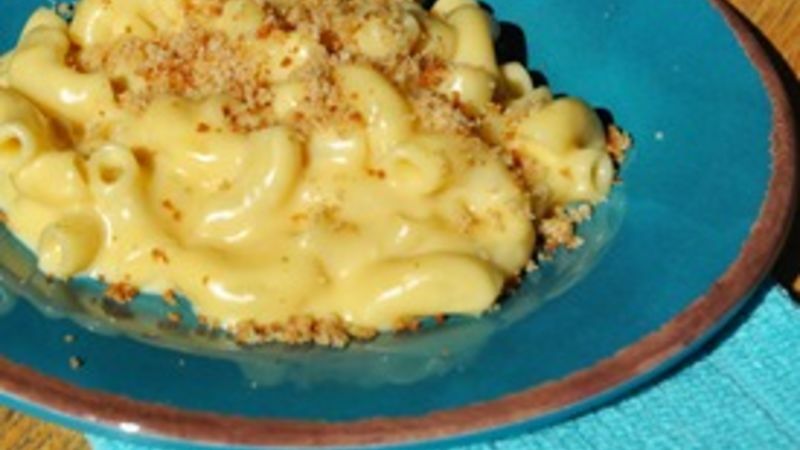 In large bowl, combine cheese sauce and cooked macaroni, mixing gently to coat noodles. Place mixture into casserole dish. Mix melted 2 Tbsp of butter and 1/2 cup dry bread crumbs until well combined. Sprinkle over top of noodles. Bake for 20-30 minutes, until sauce is bubbly. Add chicken, ham or Italian sausage if desired. Add a dash or two of red pepper sauce, or 1/4 tsp ground black pepper, for a bit more of a kick.